I love your dress + great advice! You are adorable and such an inspiration!!! Love this Katie! You are such an inspiration. @Steffi- Awww you're too sweet! Fantastic quote + you look SO cute!!! hah i just noticed that! Hurray for Katies! And all the wonder you create! thank you so much. i needed that. Those shapes on the while remind of a game I used to play when I was kid. I think it was called Suspension or something like that. Oh that is amazing! Well done it just looks so awesome! Wow! Artistic, beautiful and priceless! Hey Katie I know you probably don't have time to worry about little girls like me , but I wonder about ur raimbow crayons how did you do like, so it drippe into th wmold you know?? I was just wondering! Your colorful personality and blog always make me smile. Thanks! Looks like Moo's fur's grown back! What a great, HAPPY blog. Such a relief. Sending my friends here. Your blog is the most inspiring thing in the world. I wish my life was as colorful as yours. Katie, you are awesome! 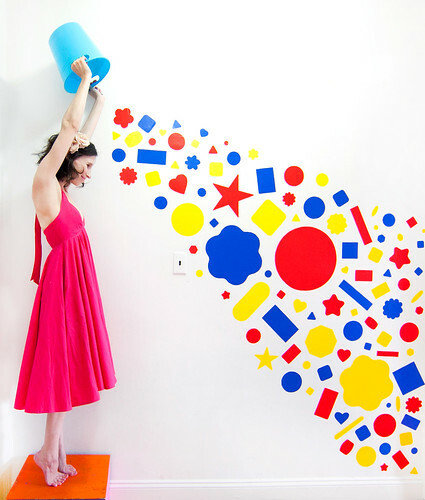 Yes, a wall like that would inspire a daily dance party. So fun. Que de joie dans la vie, merci ! I just found your blog today and I love it. So much color! Brightens up my day for sure! Those flowers turned out really colorful and nice. Never even thought about doing that. Thanks for the tip! You got style and good taste. What a great advice, very inspirational!